The Agilent Vertical Pipetting Station delivers industry-leading speed and unparalleled performance for sample handling and liquid-transfer applications. The system has an intuitive user interface, which allows the operator to create and run complex pipetting protocols with ease. Available either as a standalone unit or integrated into a larger robotic platform, the Vertical Pipetting Station will significantly reduce cycle time for your most demanding pipetting protocols. 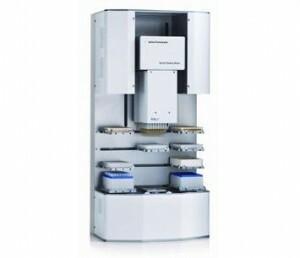 • Unique eight-microplate position, small footprint design integrates seamlessly into automation systems. • The Vertical Pipettor uses proven high-accuracy pipette heads for dispensing from 100 nL to 250 µL in 96-, 384-, and 1536-well microplates with precision of ± 0.025 mm X/Y/Z positioning. • Pipette heads are easily interchanged in less than 2 minutes. • Average cycle time is approximately 10 seconds for a microplate transfer (load tips, aspirate 40 µL from microplate 1, dispense 40 µL into microplate 2, eject tips).